Share Your Vintage Japanese DB & DBZ Stuff!! Hi guys! 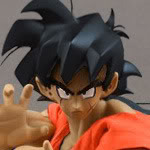 I'm a big enthusiast of 80's-90's Dragon Ball toys, especially the stuff that was released in Japan. There may have been older threads with such focus, but I wanted to breath some life into the topic. In this thread I would love to see what some of you guys have accumulated over the years from Japan (pre-2000) and share your collections and knowledge! This would also be a great opportunity to ask questions and learn more about the ORIGINAL toy lines that started it all, from other knowledgeable collectors. To kick off the thread, I'm going to share a few of my favorite (non SBC) pieces in my current collection. Well, it doesn't help that most of the DBF members who collect vintage stuff are already in your Facebook group. Neat! Do you have any of the Battle Z model kits? I’m interested in joining, however I don’t have anything older than SBC. I actually have a complete set! Whoa Larry!! How am I not seeing this comment until just now!! Haha! tokyotoybastard Were they uploaded as attachments? I had to delete DBF's storage, so if so, it must have been there. I recommend using IMGUR.com for photo hosting, but you can also use Facebook as long as you're on a computer and can right click and view the image URL. But it would have to be hosted on a public Facebook page. IMGUR is weird on a phone, so I just post pics when I'm on my computer OR I use DBF's Facebook page to host the pic. Photobucket's terrible business decision made image hosting a lot harder. IMGUR is easy and great on a computer, but totally weird on a phone. Woah, Thanks so much! I've been looking everywhere for photos of these Guys. Did you paint them, or they look like that?